I had posted this earlier as the Second largest hole in a lake. However as per the latest information received by me it is Fourth largest. I have therefore merged this post in a combined post which now includes all the large "Hole in A Lake"
The strange looking hole in the lake is actually an uncontrolled type of spillway to control the level of the Lake created by a dam. 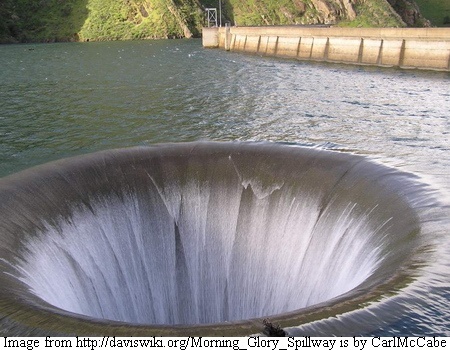 Such holes are called morning glory, plughole, glory hole, or bell-mouth spillways. 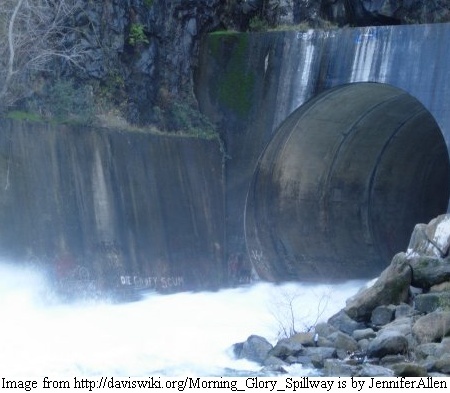 This spillway located in lake Berryessa , Monticello Dam, California is Fourth largest glory hole in the World. The intake diameter is about 22 metres (72 feet) and it tapers down to to about 8.5 metres (28 feet). Thank you Anonymous for the information. I stand corrected. My information was based on several web pages which I found in Google search. I am making a separate post about Ladybower Lake's overflow holes and will be giving due credit to you.